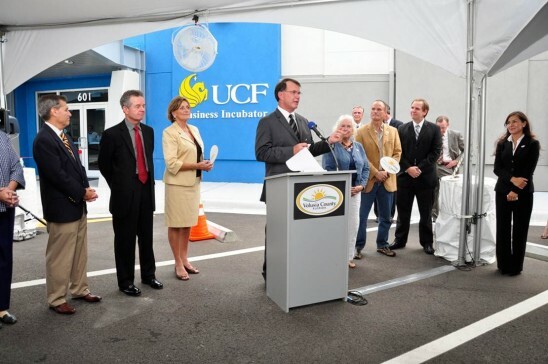 UCF's Tom O'Neal speaks at the opening of the Volusia County incubator in 2011. The University of Central Florida Business Incubation Program has been named a finalist for the National Business Incubation Association’s 2013 Incubator Network of the Year award. This is the first year for this new award category. The winner of the prestigious award will be announced April 9 at NBIA’s 27th International Conference on Business Incubation in Boston. The mission of the UCF Business Incubation Program, a university-driven community partnership that includes nine business incubators in Central Florida, is to provide early-stage companies with the enabling tools, training and infrastructure to create financially stable, high-growth enterprises leading to positive economic impact within local communities. Business incubation programs like those in the UCF Business Incubation Program’s network catalyze the process of starting and growing companies by providing entrepreneurs with the expertise, networks and tools they need to make their ventures successful. NBIA estimates that in 2011 alone, North American incubators assisted about 49,000 start-up companies that provided full-time employment for nearly 200,000 workers and generated annual revenue of almost $15 billion. Approximately 7,000 business incubators operate worldwide.